Luxurious yet affordable, this contemporary men's wedding band definitely stands out from the crowd. 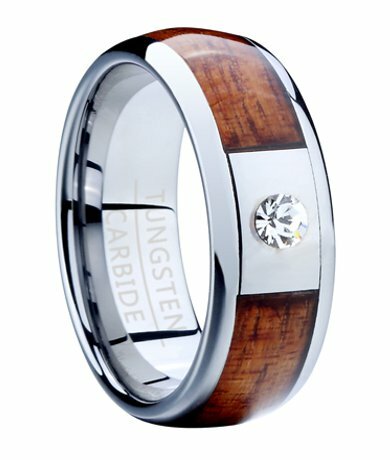 This men's tungsten ring with Koa wood has an inlay of exotic Hawaiian wood accented with a polished tungsten and single CZ centerpiece. Rounded edges and a classic domed profile complete this 8mm comfort fit ring. Comfort-fit rings should be ordered 1/2 size smaller! It's even better looking in person. Plus I needed to exchange for a smaller size. No hassle, prompt and clear communications, and I got the new size less than a week after I sent back the too large one. Love the ring. Good quality, fast shipping, and my husband gets so many comments on it. Could not be more pleased with my Mens Koa wood inlay ring with CZ purchase. Love the weight, fantastic quality and all around great looking ring! Classy and unique. Hit a snag when ordering for Christmas; wrong product was received. But, I contacted MWR and the turnaround for the right product with return label was done quickly. Also, as recommended, order a half size up with the comfort fit collections. Ordered my husbands normal size, and it fits comfortably, but a half size up would have been the perfect fit. 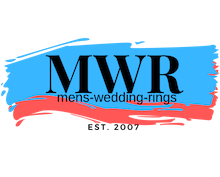 Thank MWR for quality product at a great price! Great quality ring. Really impressed with it , I wanted something different and this is perfect. As I have just received it I am hopping that thie ring will stay the same for very long time! It is always the same when you buy something sheap , you are concern about tah equality . This ring look like will not damage for long time! I am really happy with it for now. Also very happy with the service you have provided .Very professional with good communication! My fiancé loves this ring! It looks great, and seems to be great quality. We've only had it a week, so I vpcan't comment on the durability, but this is a fantastic piece, especially for the price! Unique and elegant! We ordered a half size down per the "comfort fit" instructions and it fits perfectly.